Choose the cart size to meet your appliacation needs. These trucks combine the convenience of 3" deep trays for accumulating and transporting smaller parts with the rugged durability of an all-welded unit. Shelves are formed from 12 gauge steel, with 3" high sides. 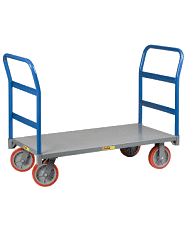 2 swivel and 2 rigid non-marking polyurethane casters for easy maneuverability and quiet operation. Clearance between shelves is 22-1/2".